When people set New Year’s resolutions, many include a weight loss goal. My husband and I took a different twist on this since he doesn't have additional pounds to lose and I have just a few. We want to eat in such a way that we maintain our ideal weight and keep our bodies in great working order so we stay healthy and avoid taking medications as we get older. But in our search for the best foods to consume in order to achieve that result, we discovered that this topic is as emotionally charged for some folks as religion and politics. For example, there’s a world of difference between a vegetarian/vegan approach and the currently popular Paleo diet; and the two sides can be seen colliding publicly on blog sites and Amazon book reviews. In an effort to get to the truth, we are voraciously consuming books, videos and articles that shed light on the science that supports – or fails to support – specific claims. We've come to recognize that much of the conventional wisdom around diet, weight loss and healthy lifestyle is often based on conjecture or flimsy evidence rather than solid science. The result of all this study is a total shift in our attitude about certain types of foods. I’ve been reminded once again how hard it is to change our thinking and our habits once the brain has ingrained certain patterns. 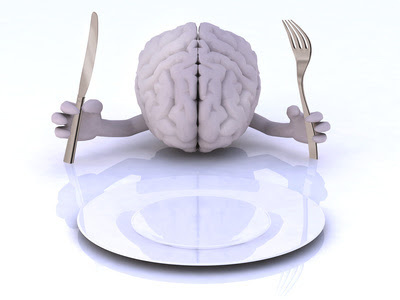 Some of my most deeply held beliefs about food have been turned upside down, and I’m rewiring my brain as a result. Eat more healthy whole grains. In Wheat Belly, Dr. William Davis explains why this mantra from such revered sources as USDA, American Heart Association, American Dietetic Association and American Diabetes Association is severely flawed. The modern version of wheat creates all manner of health issues, and eliminating it can reduce a variety of seemingly unrelated symptoms like inflammation. Avoid fats, especially saturated fat. Award-winning science writer Gary Taubes reveals in Good Calories, Bad Calories the faulty research that led to this widely-adopted advice. For decades we've been told to avoid butter, meats and other foods high in saturated fat. Low-fat products abound in Western diets, yet we’re still gaining weight. He makes a strong case that consuming fat, even saturated fat, is not the real problem. In his second book, Why We Get Fat, Taubes refutes the “calories-in, calories-out” explanation for the widespread obesity epidemic and points out the solid science that’s been ignored by government agencies and other groups that seek to influence what we eat. He presents compelling evidence that refutes the low fat-high carb diet recommended by most doctors and nutritionists. Sugar is “generally recognized as safe” by the FDA. Robert Lustig is a pediatric endocrinologist who’s spent the past 16 years treating childhood obesity and studying the effects of sugar on the central nervous system. His 90-minute YouTube video, “Sugar: The Bitter Truth” has been viewed more than 3 million times. Watching it made us realize just how damaging sugar can be to the body, and his new book Fat Chance explains the dangers of modern industrialized foods on the hormones that control hunger and weight. Sifting through these and many other resources has resulted in major changes in our eating habits. When I’m adding coconut oil to my kale or cooking with pastured butter, I still have to remind myself that these ingredients are not clogging my blood vessels. It will take time to acquire the new patterns until they become automatic and free of guilty thoughts and feelings. But that’s true of any change. If you want a different outcome, the way you think about yourself or a specific situation has to shift. And that means letting go of old beliefs that no longer serve you well. It’s not easy but it’s definitely worth the effort, especially when your long-term health is at stake.